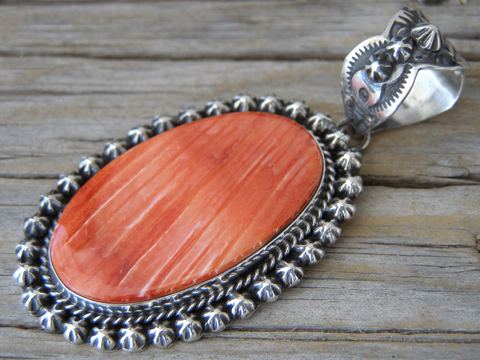 This pendant is set with a beautifully striated oval of red spiny oyster. The bezel is wrapped with twist wire and the border is formed by starred buttons. The bale has a scalloped edge and starred buttons set in a vertical row. Spiny oyster: 1 3/8" x 3/4"
Dimensions of pendant (excluding bale & jump ring): 1 3/4" x 1 1/8"